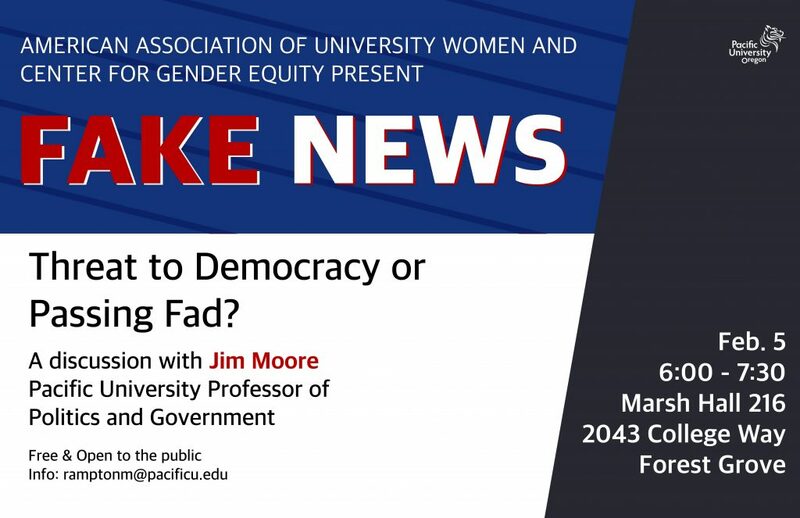 Professor Jim Moore will speak on the timely subject of Fake News. Will this nomenclature become a permanent element of civic discourse, or is it particular to our current political climate? Dr. Moore serves as the Director for Political Outreach of the Tom McCall Center for Civic Engagement and teaches in the Politics and Government department. He has been interviewed over six thousand times since 1991. Look for his analysis in articles in newspapers throughout the Pacific Northwest, on NPR and Portland’s KOPB radio, KXL radio, and scattered through the national media (PBS, CBS, ABC, CNN, Fox). Dr. Moore is writing a biography of Vic Atiyeh, Oregon’s governor from 1979-1987. Atiyeh was the country’s first Arab-American governor, he laid the ground for Oregon’s high tech industry, and he was the last Republican to hold the gubernatorial office.